The nation is saddened as we hear about loss of life and people’s homes during devastating wildfires. Many churches as well as businesses and historic structures have been destroyed. President Trump sent his condolences, but at the same time attacked the fact that forest mismanagement has been going on in California. This prompted Jerry Brown and the progressives to use the opportunity to promote global warming. Gov. Jerry Brown is using the wildfires to campaign for climate change legislation that won’t address the problem. Governor Brown is using the wildfires to push his political ideology about climate change. Thank you Craig, for clearly and extensively stating what I already know about California’s mismanagement. And thank your, President Trump, for calling it like it is despite the automatic and hostile opposition. I’ve moved out of California, what once was a beautiful state and a wonderful place to live because I could no longer afford the cost of living or tolerate the smothering leftist political environment. What can be done? Very little to push back the deep state, short of prayer. Much prayer. I believe the fires and other acts of God in California are just that: acts of God and His judgement on a profane majority run by godless leaders. I am so sorry for you and my friends and family who live in a state I once loved. God bless. Thanks for spending the time to research on the fire problems in California and for making constructive suggestions. How do you make them listen? I can see how this so-called “Global Warming” will be used as an excuse during the Tribulation, when God destroys part of the earth through fire, because Man will be able to continue denying God’s power and existence by just blaming it on the Global Warming. It’s so incredible to watch all the prophecies of Revelation fall into place, and how the God-denying Liberals have become Satan’s pawns. We cannot lean on any one person for Salvation… Jesus, and Jesus only, will be our Salvation! Thank you Craig! You are right on target with your explanations and information. Makes sense and I don’t see how intelligent people can be so manipulated into thinking otherwise. This was brilliant! Please try to get it published in the newspapers across CA. Thank you, Craig!! I have lived in CA for over 40 years and you are spot on!!!!! Thank you for educating so many people to the REAL facts behind what is happening to our great state, being ruined by the brainless people in charge of governing it. The last time we prospered was when Ronald Reagan was our governor. Gavin Newsom will just continue to destroy our state over the next four years–SAD! Time to pack!!!! Thank you Craig for this insightful information regarding the wildfires. So sorry for the lost of lives and the devastation of property loss. Prayers for all the victims. 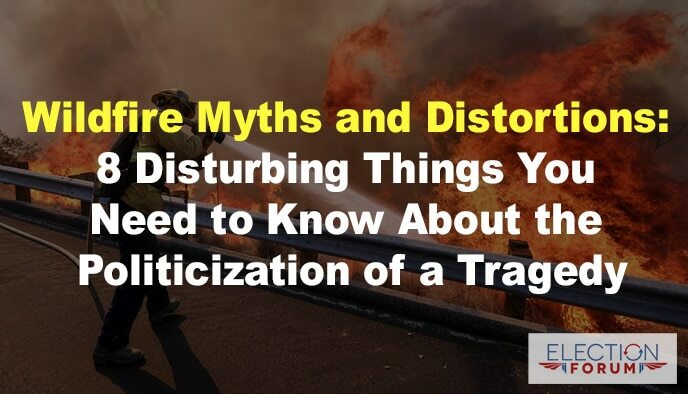 Thank you for providing the facts and some common sense about California’s wildfire problems. Contrary to what Governor Brown implies, although climate change certainly exists, it is not something new – it has been going on for over billion years; and California, as well as the rest of the earth, has been much warmer at times than it is now. Over a thousand years ago, California had droughts that lasted, not for years or even decades, but for centuries. Has anyone ever thought that maybe the government (California state and federal) might be causing all of this to happen? Remember, many of the leftist politicians including Jerry Brown, are all globalist environment worshippers. The government has the capability by extreme advanced technology to manipulate and control the weather. Has anyone stopped and asked the question: why does California have so many months and years of drought? This is not normal, just like the many fires in “certain, specific parts” of the state, are not normal. Has anyone asked the question about the “chem trails”? Chem trails are also adding to the “drying” problem in certain rural areas of the state which makes those areas very vulnurable and combustible to fires. So then, “who” is setting the fires or “how” are the fires being started? The right questions are not being asked so the right answers cannot be given. Since Jerry Brown has been back in office as governor of California, he has been forging ahead a very radical, environmental agenda, which is why his answer to the wildfire problem is “climate change”. Everybody knows that climate change or formerly named “global warming” is a hoax touted by the globalist environmental radicals. Jerry Brown ran for governor again so that he could further the agenda of these radicals.That’s what all of this is about: everything is for the environment, about the environment, and he wants to make Calfornia the “poster child” state for the entire nation of what an “environmentally-friendly” state looks like. And remember, where California goes, so goes the rest of the nation! This is a very elaborate scheme to radically and fundamentally “transform” California into a United Nations-backed, completely environmentally-controlled, ideal “green” state, and everything that is happening was planned to happen to move California on-schedule with the tyrannical dictates and takeover of the United Nations. Jerry Brown has been a very willing, cooperative, puppet and is getting as much of the job done before he leaves office. Nothing is happening by coincidence but puposely to promote the agenda which is far more evil and sinister than anybody thinks or knows. Do your research people, you will find out what I’m talking about is true. 25 Tirzah you are right, and we cannot get them out of office they have created the biggest voter fraud schemes America has ever seen the people have to take a stand and make our politicians see that this stops and stops now!